I have another blog aside of this one. It is a blog where I have my opinions, my rants and my general meandering thoughts. Tonight though I have a rant that is best posted on here. To like minded, like shaped people. Hell, just people. 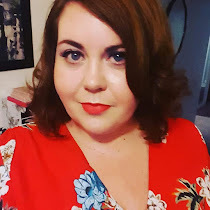 As a plus size person you get used to a certain number of comments, views, media perceptions, collective views etc about your size, your looks, your clothes. In my case in general I am forming a "sod off if you don't like me" attitude, but there are still certain things that make it through the screen. The first is an irritant. You know the one, I'm sure that many of you have had the same comment, and it bugs the hell out of me. "You're a pretty girl, just think how good you could look if you were thin". I can never reply properly to these comments. Mainly because what I want to reply in retort is just as bad, because I want to hurt back. The second is the comments that hold you back from being what you want to be, look how you want to look. Tonight for me it was someone looking at some red skinny jeans I had ordered. The "look" up and down, along with the comment of "Oh...... Well maybe if you wore a really long top over them". To be honest, I'm not sure on them myself having only recently talked myself into exploring more colourful options. But thanks to that comment, my attitude is bugger you, I'm ordering and I will damn well work them! I promise, tomorrow I will be back with a post full of pictures, and no rants.